Friday May 29, 2015, we did our second, post-et4buddy hangout and the first official Hangout to be announced and posted on the Virtually Connecting website. In this post, I’m going to talk a bit about our hangout. 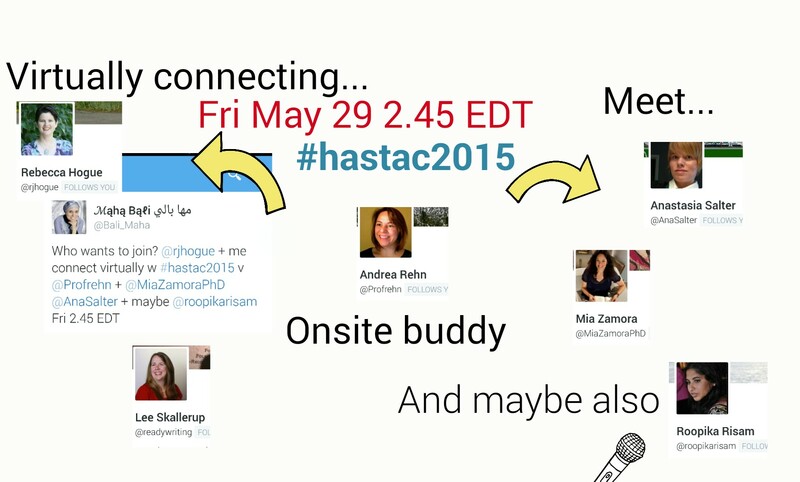 This post is cross-posted to Rebecca’s website, Virtual Connecting, and Rebecca’s HASTAC blog (I was a HASTAC Scholar before I had to step away during cancer treatment). First, I would like to thank Andrea Rehn for offering to be our onsite ‘buddy’ for this hangout. I met Andrea briefly at the #et4online conference, and Maha has been a friend of hers for some time now. They co-presented about an online Twitter game #tvsz at #et4online. Preparation for today’s hangout, and today’s hangout allowed Andrea and I to connect a little more :-). Onsite: Andrea Rehn (@profrehn), Mia Zamora (@MiaZamoraPhD), and Anastasia Salter (@AnaSalter). In addition, joining us online were: Helen DeWaard (@hj_dewaard), Autumm Caines (@autumm), Scott Johnson (@SHJ2), Maha Bali (@Bali_Maha), and myself Rebecca J. Hogue (@rjhogue). We represented three countries: United States, Canada, and Egypt. I thought it was particularly interesting that three of the online folks (myself, Helen, and Scott) were Canadian – although I was joining from my current home in Santa Clara California. Listening to each of these powerful women speak about the courses they teach made me wish I was an undergraduate today. I’d love to be in any one of their classes. For this hangout, Andrea did a particularly good job of finding an appropriate location. The “couch” in the corner not only helped to avoid background distractions, it also help to make those attending onsite feel more relaxed. It helped to set the tone for the discussion, which those of us participating online could feel. It was like we were all sitting on couches together. This session ran more like an interactive panel session. I really like the format. Each of the virtual participants had a chance to ask a question to the onsite panel, and each of the onsite folks had a chance to respond. The resulting dialogue was very rich. Throughout the hangout the onsite folks do a fair bit of giggling. This is something that I remember from being onsite as well. It is both because it is fun, but also is a sign of nervousness. We laugh off the hiccups that happen during the actual hangout. 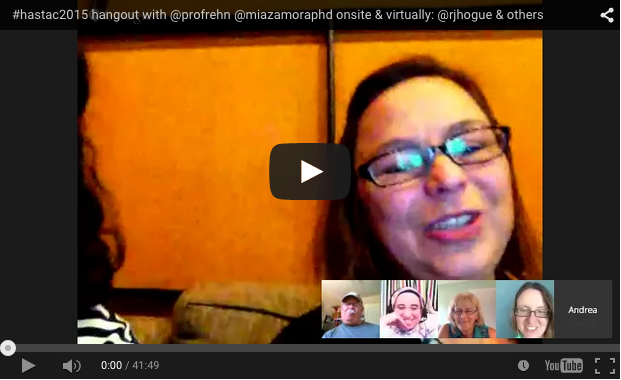 One of my tips for preparing to host a hangout is to Embrace Imperfection. The ‘buddy-style’ event hangouts are about creating that informal space for conversations while breaking physical boundaries. This hangout does a great job of demonstrating to be both informative and informal. I’m looking forward to hearing what others think about it. Please leave a comment below. Got a conference you want us to cover? Comment here or send a note to Rebecca (@rjhogue) or Maha (@bali_maha).